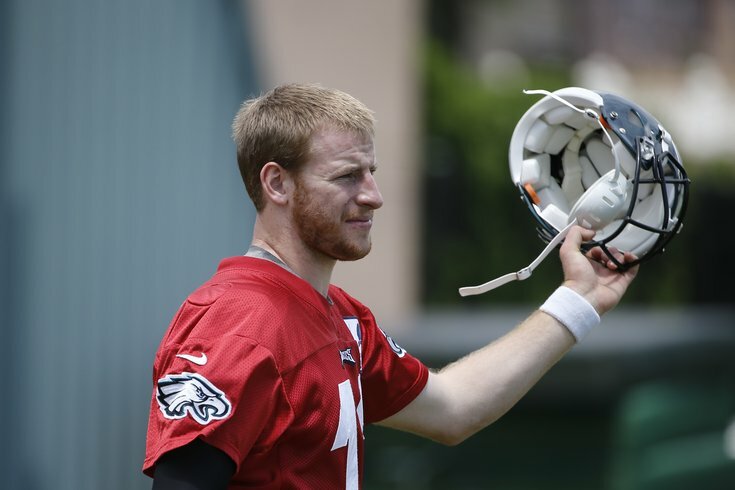 Carson Wentz is like a turbo-charged version of Blake Bortles. Leading up to training camp, as we did last year, we'll be comparing each of the Eagles' rookies to current NFL players. We'll be leading it off, of course, with the No. 2 overall pick, Mr. Carson Wentz. Six players eligible for NFL Supplemental Draft: Should the Eagles have interest? During the pre-draft process (and then thereafter), Wentz was compared to a wide assortment of current and former NFL quarterbacks, many of which are huge names. That list included guys like Andrew Luck, Ben Roethlisberger, Cam Newton, Joe Flacco, and even Brett Favre. Personally, I don't have some obscure name nobody has thought of yet, and really, I don't think there's a perfect comp for Wentz. The combination of his background, stature, and skill set are unique. However, the one common comp that I do think fits the best is Jacksonville Jaguars quarterback Blake Bortles. Like Wentz, Bortles was a late riser leading up to the draft, who was not thought of as a first-round pick when his final college season began. Bortles ended up being drafted third overall by the Jags in the 2014 draft, one spot behind where the Eagles snagged Wentz a few months ago. When you compare the two players, Wentz's and Bortles' physical measurables are consistent, in that Wentz is a little better than Bortles in nearly every category across the board. From a measurables standpoint, Wentz is an upgraded version of Bortles, like a next version of the iPhone. Over his last two seasons at UCF, Bortles had a 22-5 record, winning a bowl game after each season, including an impressive victory over sixth-ranked Baylor in his college finale. Wentz, meanwhile, went 20-3 over his last two seasons, winning a pair of FCS National Championships, although obviously, he wasn't facing the same level of competition as Bortles. Wentz probably has the stronger arm, but the area where I see the most similarity, in terms of style of play, is that both players will take shots down the field. All throughout OTAs and minicamp, Wentz was easily the most aggressive of the Eagles' three quarterbacks, throwing far more passes to the intermediate and deep sections of the field than Sam Bradford and Chase Daniel. Bortles shares that same gunslinger mentality. Here's a Bortles highlight reel, in case you don't exactly catch your fair share of Jaguars games.